I have done battle with the binding machine and submitted the hard copies of my dissertation. It is well and truly done. I have already visited a few blogs and have plans to visit many more – I have missed the fun of sharing this great hobby with other enthusiasts. I have lots of plans, plenty of photographic projects in the pipeline. But I also want to share some of the photos I took during our holiday to the Channel Islands this year. 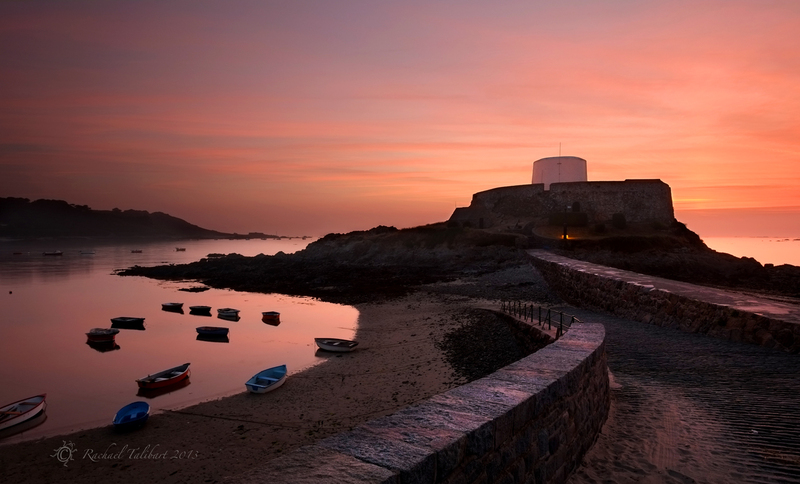 This is Fort Grey, on Guernsey’s West coast. Inside, there is a fascinating shipwreck museum which I heartily recommend. It is never easy trying to do landscape photography on a family holiday. At this location I noticed the best viewpoint of all just as we were driving away and couldn’t bring myself to ask the family to stop again while I captured it. This will have to do. Mostly it was too hazy while we were there and there weren’t enough clouds to make interesting sunsets, but this evening was an exception. This entry was posted in Channel Islands, photography, travel and tagged castle, Channel Islands, Fort Grey, Guernsey, landscape, landscape photography, photography, sunset, tower by Rachael. Bookmark the permalink. Oh! Definitely a great evening sunset shot! Superb composition and so very, very lovely to have you back amongst us bloggies again! Congrats on getting the dissertation done. Did you do anything to celebrate? Great photo – perfect photo for the end of your mammoth task! I had a glass of wine in front of the tele. I know,sad .. But true! WOW and double WOW Rachael.. wonderful to have your dissertation finished..